I've been putting my researching skills to good use. 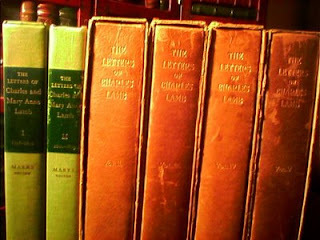 We just finished cataloging the library of Charles Lamb on Library Thing. In addition to citing reference lists identifying some of the books in Lamb's library, we researched Lamb's letters contained in the Bibliophile Society and Marrs editions. You can find out about the group "I See Dead People's Books" here.